Timber gravel boards are an essential piece of many garden features. They are used as a retainer, to prevent small amounts of soil from accessing the base of fences. This means that they prevent a full range of fencing solutions, from fencing boards to panels and even closeboard fencing from rotting due to constant exposure to harmful elements. They provide an effective barrier between the ground and the fence, which can be essential when the ground is wet or damp. This allows your border to avoid damage from moisture and other potentially harmful ingredients. 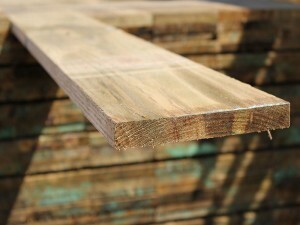 Why Do You Need Timber Gravel Boards? Timber gravel boards remain an essential part of any wooden fence, and could really work to save you money in the long run. These sacrificial boards take the brunt of moisture damage from the earth, allowing your fences to retain their structural integrity and avoid rot. After several years, instead of replacing your entire fence as it starts to rot from the ground up, you will only need to replace these gravel boards. As well as taking a lot less time and effort, it can also be a great way to save money. 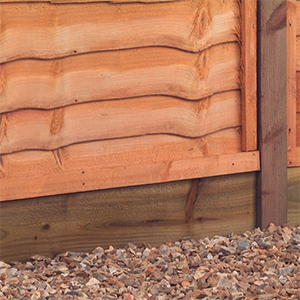 Full protection of fence panels or featheredge boards against ground-level dirt and moisture. Can be quickly and easily installed and replaced to ensure that the fence panel does not touch the ground. Our timber gravel boards are all pressure-treated to ensure long-lasting durability and prevent rot. What’s more, these rustic pieces of wood can add a unique design to your property and really help to create a warm, comfortable atmosphere. When it comes to great garden design, it’s all about the little touches. With these gravel boards, you have the advantage of being able to combine that focus on detail with practicality. At Challenge Fencing, we can provide pre-treated and durable timber gravel boards to protect your garden fence from moisture damage. Including these great sacrificial boards in your garden design can not only improve the reliability of your fencing, but add unique character and save money in the long run. For more information on the advantages of these gravel boards for your garden, or to place your order, get in touch with your local branch of Challenge Fencing today. We can provide a complete range of garden fence essentials, including full fence panels, posts and more.